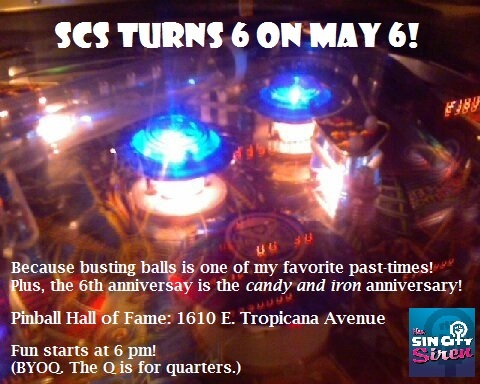 SCS turns 6 on May 6! Even though I’m still recovering from a sinus infection that started the day after the NOH8 in Las Vegas hate crimes event (going on two weeks, bleh), I just hate to let another SCS anniversary drift by like some sad tumbleweed caught in a desert windstorm. Then I looked up the traditional anniversary gift for six years. It’s candy and iron! And I know it’s been a ridiculously busy spring with no signs of slowing down now that the Legislature is cranking out hot bills left and right. What we really need is some good, old-fashioned, stress-free fun! Come shoot some metal balls with me at the Pinball Hall of Fame, 1610 E. Tropicana Avenue. Think of it as happy hour — get in touch with your inner child happy hour — with candy!